Our class meets for lecture on Tuesdays and Fridays from 11:25-12:15PM in LC100. Then (also on Tuesdays and Fridays) we have section from 12:30-1:20PM in HUM118. 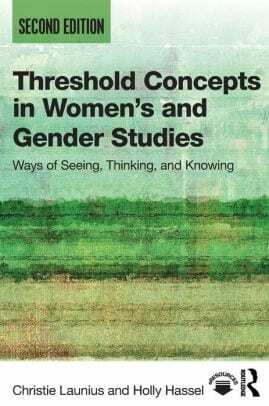 Threshold Concepts in Women’s and Gender Studies: Ways of Seeing, Thinking, and Knowing edited by Holly Hassel and Christie Launius. You must complete readings before the class session for which they are assigned. We have one required book for this course that is available at the bookstore and for loan at the library. CLASS CANCELLED DUE TO SNOW/ICE! In this section of the course, we devote class sessions to key conceptual tools and frameworks that we will draw on throughout the remainder of the semester. Click here–> Intro to WGSS_SP19_2.1_Bauer to download Powerpoint Slides from Lecture! PDF: Ramirez, Renya. 2007. “Race, Tribal Nation, and Gender: A Native Feminist Approach to Belonging,” Meridians, Vol. 7, No. 2 (2007), pp. 22-40. Tuesday, February 12 | CLASS CANCELLED DUE TO SNOW/ICE! Tuesday, February 19 | NO CLASS (MONDAY SCHEDULE) BUT MAKE UP WORK FROM SNOW DAY: DUE 2/22 before class! In this section of the course, we address specific topical areas and issues that have been the subject of feminist thought and action. Pérez-Rosario, Vanessa. “On Beauty and Protest” pp. 279-285. White, Michele. “Beauty as an ‘Act of Political Warfare’” pp. 139-156. Gentles-Peart, Kamille. “Controlling Beauty Ideals: Caribbean Women, Thick Bodies, and White Supremacist Discourse” pp. 199-214. PDF: Chinyere Oparah Bonaparte. 2015. “Introduction,” in Birthing Justice: Black Women, Pregnancy and Childbirth, pages 1-15. PDF: Ehrenreich, Barbara, and Deirdre English. 2010. “Witches, Midwives, and Nurses: A History of Women Healers” pp. 1-24. Angela Johnson et. al., “Common Challenges Faced by Women of Color in Physics, and Actions Faculty Can Take to Minimize Those Challenges,” The Physics Teacher 55, 356 (2017). Prepare for Section: Bring the highlighted/annotated/underlined reading printed out to class. We will work on reverse outlining! Prepare for Section: Bring an idea for your platforms essay. In this section of the course, we examine a number of specific sites and movements where feminists have worked to create individual and collective change. Online: Audre Lorde “The Master’s Tools Will Never Dismantle the Master’s House” You can also listen to her give the speech and the audience reaction. Lorde’s remarks start at about 41 min on the bottom recording, and continue (w/ a small gap in recording) on the top tape. Prepare for Section: Bring a 3-page draft to section for peer review. PDF: Combahee River Collective, “A Black Feminist Statement” (United States, 1977), pgs. 325-330. PDF: Garza, Alicia. Interview with Keeanga Yamahtta Taylor in How We Get Free, pgs. 145-175. PDF Excerpts from hooks, bell All About Love: New Visions pages xv-14 AND 207-237. How am I implicated in today’s lecture? How can I apply, and/or how do I relate, to today’s topic? The hawksite is the syllabus. Updates will post on the front page. Students are responsible for *frequently* checking the page. This site is not static, like everything else in life: things change! I will use your university email address. You must check your university email account regularly. You are responsible for all information posted here and via email.